Last fall and winter 2011, nearly 100 people from all across the United States and overseas donated a total of $6,620 to support building new classrooms and help complete a national sign language dictionary and grammar DVD project. Here’s an update on what’s happened so far with your generous support of Rohana Special School and Ruhunu Sumaga Circle of the Deaf. 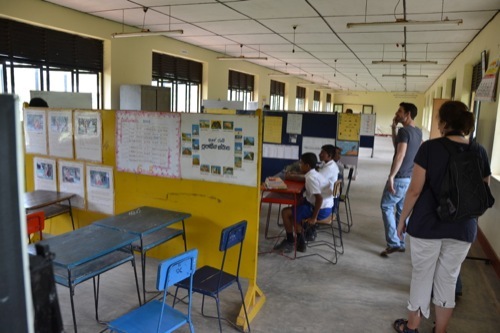 RSCD, the deaf association that represents hundreds of deaf and hard of hearing in the Matara district in southern Sri Lanka, has been hard at work developing their sign language dictionary and grammar DVD project. This DVD is aimed at teachers of deaf children working in more than a dozen deaf/special schools nationwide. They (and I) believe that one of the most effective ways to improve deaf education is to have teachers who not only are well-trained, but who can sign well. Thanks to your support, they received a much-needed cash infusion of more than $1,000 to keep this project going. Here is a thank you letter from RSCD. These money will go to purchase audiovisual and IT equipment including video/graphic cards, a HDMI video capture card, an external HD, as well as paying daily expenses (travel and meals) for the members of the sign language research group. When the footage and editing are complete, RSCD will print 3,000 DVDs and distribute them free of charge to schools and teachers nationwide. Below are some photos of them hard at work at RSCD’s headquarters located about a mile from Rohana Special School. The research group includes a team of Sri Lankan students who are being trained in sign linguistics at the Chinese University of Hong Kong’s Center for Sign Linguistics and Deaf Studies. How about that? Remember, YOU made all of this happen! I’m deeply grateful for all of your support for these two organizations. If you have any questions or comments, please post them below or contact me directly. Thank you! This successful fundraiser has concluded! 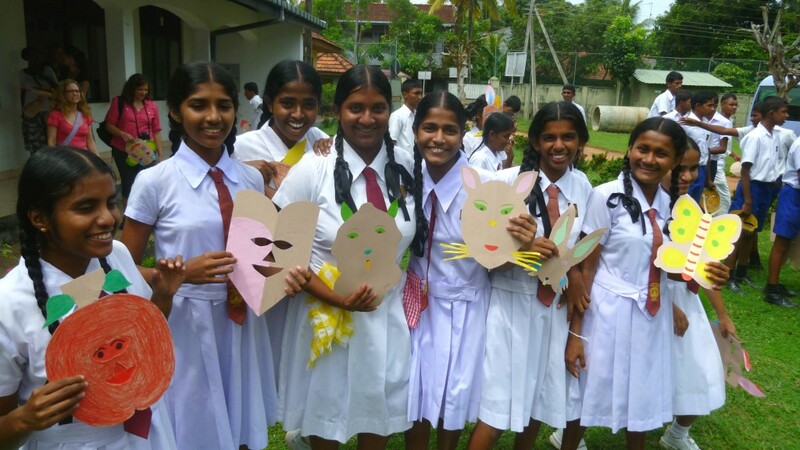 Go here for updates on how your generous support and donations were put to good use to improve the education of deaf and hard of hearing children in Matara, Sri Lanka. 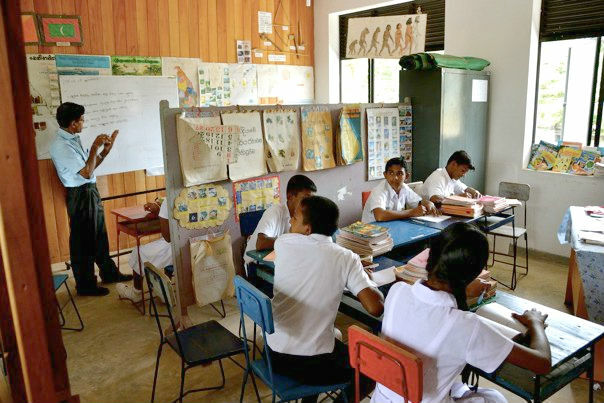 This fall, give the gift of education to Deaf children and adults in Sri Lanka! Last July, I joined 10 other deaf people on a tour of Sri Lanka. Among verdant jungles, ancient temples, and more elephants than you could shake a bamboo stick at, we visited a deaf school: Rohana Special School, and we visited a deaf association: Ruhunu Sumaga Circle of the Deaf. We spent two days working with both organizations–for example, we facilitated arts and sign language workshops for the children and learned about where and how deaf adults find employment. I am sharing this information with you because they need your help. Eight (8) New Classrooms: At Rohana Special School, the secondary level students and teachers work and learn in cramped environments. 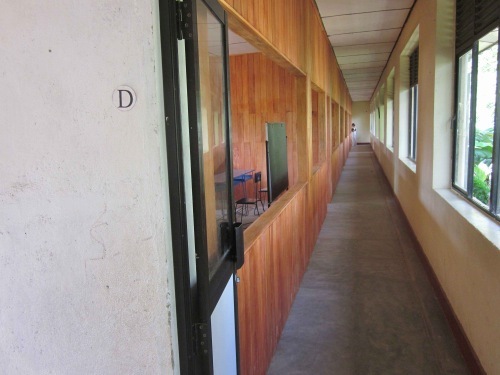 They have a few secondary classrooms, each approximately 10×10 feet, but they have to put two classes in each room. That means two teachers teaching separate classes in the same room! (see photo) The school currently has a large hall that they want to divide into eight classrooms. But they lack the funds to build the dividing walls, windows, and doors. Sri Lankan Sign Language Tutorial DVD: Ruhunu Sumaga Circle of the Deaf is working on Sri Lanka’s first sign language tutorial DVD. This project is targeted towards improving the sign language skills of teachers of deaf children. 3,000 copies will be printed in its initial run. While they have begun the project, they lack the funds to edit the video footage and print the DVDs. Will you help me in reaching my personal goal of raising $1,000? My 10 fellow travelers are each raising $1,000, too, for a total of $11,000, which will be enough to fulfill both initiatives. A donation, small or large, will go a long way. Remember, children need space to learn, and deaf children who use sign language deserve to have teachers who are also fluent in sign language. Your support will help make both goals possible! Please remember that donations made to this cause are not tax-deductible as we are not a 501(c)3 organization, but you will receive a donation acknowledgement letter and updates on how your donation money was used by both organizations. 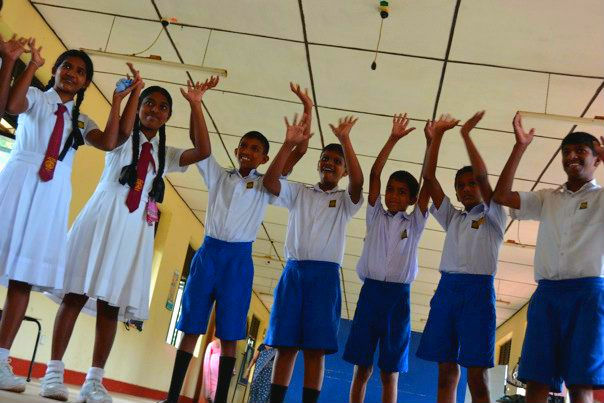 Thank you for your donation—your support will brighten the future of deaf education in Sri Lanka! Rohana Special School, a school for children who are deaf, blind, or have learning challenges. Out of about 130 students age 5 to 20, approximately 80 are deaf or hard-of-hearing. Ruhunu Sumaga Circle of the Deaf, an association of deaf adults serving the greater Matara area in the south of Sri Lanka. It has nearly 400 members and provides extensive services such as job placements, after-school tutoring for deaf children, and advocating for civil rights. Adam Stone volunteered at Rohana Special School in 2006-2008 and organized last July’s tour of Sri Lanka; he has very close ties with both Rohana Special School and Ruhunu Sumaga Circle of the Deaf. He is also the administrator of this website; please contact him if you have any questions or want to check on the status of your donation. Many of you know that in 2006 and 2007, I lived and worked in Sri Lanka for nine magical, unforgettable months. I was a volunteer at Rohana Special School, a school primarily for deaf children in Matara on Sri Lanka’s southern coast. I wrote extensively about my experiences at my blog, Found In Ceylon (www.foundinceylon.com). Even years later it’s difficult to overstate the impact that Sri Lanka made on my life. I worked hard—both by myself and with other volunteers—to empower the students, the teachers, and the overall Deaf community in Matara. We made sports uniforms, retrofitted the classrooms with whiteboards, published a dictionary, found jobs for graduates, set up sign language classes for residential staff, and implemented Deaf education training programs for teachers. Together we transformed the school into one of the best special schools in the country. My journey in Sri Lanka has made me who I am now, a Deaf kindergarten teacher at P.S. 347, an ASL-English bilingual school in New York City. But my nine months in Sri Lanka weren’t just about the school. The country has a wealth of amazing ruins, temples, monuments, wildlife, beaches, forts, and jungles. The New York Times called Sri Lanka the #1 place to visit in 2010. Millions have visited the country; many have kept coming back. People say the country is imbued with an extraordinary aura, a spirit of luck, serendipity, and loving-kindness. I believe them, because I’ve seen and felt it. And now it’s your turn to see Sri Lanka. Leading a tour to Sri Lanka for Deaf and signing adults has been one of my dreams, and I’m doing it. Next summer is your chance to visit this island. This recreational trip will be about sightseeing, journeying, and relaxing. Check out the amazing itinerary below—you’ll be experiencing the best Sri Lanka has to offer. But no trip is complete without some measure of “giving back,” and as guests, you will plan and provide two short workshops at Rohana Special School focused on sign language and arts & crafts. We will also visit deaf associations and meet Deaf people working in various professions. Arthur C. Clarke, Sri Lanka’s most famous expatriate, wrote, “The island is a small universe; it contains as many variations of culture, scenery and climate as some countries a dozen times its size.” What are you waiting for? Sign up now and get ready for an unforgettable experience—an intimate, all-signing group traveling through the Pearl of the Indian Ocean in July 2011. I never explained how I first came to Sri Lanka. My journey started with an e-mail that I blew off for three months. My mom asked me and my sister, “Can you think of anyone or an educational agency that would be interested in this project?” I don’t think she ever expected that I’d be that “anyone” who went over there. But it was March 2006, six months before I hopped onto the plane for Asia, and I was still gainfully employed in my first full-time job as a consultant for a government contracting firm in Washington, D.C. “Consultant” is a rather broad term in D.C.-speak and I got to work on a lot of different projects as well as manage DeafDC.com. Back to the e-mail. “Can you think of…an educational agency?” Eh. Yet another e-mail about some poor deaf school in a remote part of the world. Not really my problem, I thought. I’m a little busy right now. And off the edge of my browser window it went, buried under a torrent of more pressing, more current, more local e-mails. Three months later at the end of June, I found myself on a quiet Sunday morning cleaning out my Gmail inbox. I remember it very clearly: lying on my back on my bed covered with that awesome striped blue and white Nautica comforter. Exposed brick walls all around me in my basement room at 427 16th Street SE. My knees were raised so I could stretch out my lower lumbar. My iBook G4 resting on my waist. My mom’s e-mail comes up once again, and this time I read it more carefully. It’s actually a forward of a forward; the original composer is Nerissa Martin, a friend of Julie. “Anyone with skills re teaching deaf kids would be fantastic. Maybe the best thing would be to get them to email me.” And then in the middle of the e-mail is Nerissa’s address. By then I’ve grown disillusioned with my D.C. life. My dreams–travel! see the world! do something outrageous!–were slipping away as I continued to define myself by a job that I no longer loved. I was weary of endless DPHHs and had recently decided that I didn’t want to go to law school anymore. What was ahead of me but yet more questions? Even now, I’m not sure what drove me to clicking on Nerissa’s e-mail address and composing a new message. My parents are close friends of Judy and Jim Regan…they passed along your e-mail a few months ago…I’m wondering if you’re still looking for volunteers to participate in the project…I can create a website…write often…supplement learning…enrich their education…I’d like to grab this opportunity to contribute in any way I can. Adam, you sound great; please come. Uh, Nerissa, I don’t need to do an interview or fill out a form? Adam, nope, just come. Okay, Nerissa, I’ll be there September 19. Mom and Dad, is it okay if I go to a war-torn island thousands of miles away and teach deaf children for free? Sure, Adam, follow your dreams. Tonight, two years and seven months later, I’m in my room, having just wrapped up a webcam session with my dear friends Amila and Lakmal. I haven’t talked to them since my second trip there last June, and we catch up on the news. Amila’s now a full-fledged computer teacher and matron at Rohana Special School. I show them my hoodie jacket and a pomegranate fruit, and introduce them to my mom, who promptly asks both of them if they’re married. I wonder if my mom was Sri Lankan in a past life. They tell me that this week nine students are traveling to Tangalle to take the O/L exams. After saying good-bye and closing the chat window, I consider that I’m in the middle of my first year of graduate school, studying to become a bona fide teacher of the Deaf two years after I taught my first English class. I now have dear friends on the other side of the world, just a phone call away, and a lifetime of photographs and experiences from that special island. Did all that happen with just one e-mail from a friend of my parents? Earlier today, I watched my parents say good-bye to that friend, Jim Regan. He suddenly departed this world shortly after Thanksgiving, leaving us all behind to ask an anguished “Why?” At the memorial service, set in verdant surroundings that rivaled the Sri Lankan jungles, heartfelt stories were told about a gregarious man who touched countless lives. My father was the emcee; his old law partner Richard delivered the main eulogy. Last week, I was communicating with Nerissa and David, typing out the details which they needed to know. I ask David if he recalls that the Regans were the reason I found out about them and Sri Lanka in the first place. Vibrations…through an e-mail. Through a video chat. Through a handshake or a hug. Can entire lives be revealed and resolved through these vibrations? Thank you, Jim and Julie, for everything–for the journey to Sri Lanka, and for the journey I’m now on.